I was on my way to Vegas this weekend when I passed the notorious "Zzyzx Rd." sign off I-15. I decided to investigate. I drove partway down the empty highway until I found a gas station with a wise, elderly attendantЕ who had no idea about the history of Zzyzx. He also didn't speak much English. I continued on to Vegas. I had money to lose. But I promise more personal investigation in future entries.  In the meantime, we have the internet. 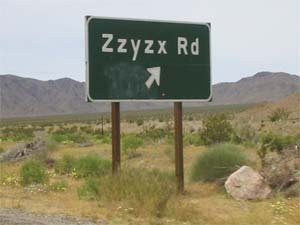 Zzyzx Road is probably one of the strangest-named roads in all ofЕ anywhere. But how did it get named that way? That's where the quackery comes in. Once upon a time, there was a radio evangelist named Curtis Howe Springer. A self-proclaimed medical doctor and Methodist minister, Springer was in fact neither of these things, although he was in 1969 named "King of Quacks" by the American Medical Association. Springer wanted to start a health-spa/resort where he could live and sell the various "miracle cures" he advertised on his radio show, so in 1944 he and his fiancйe picked out a tract of federal land in the desert near Baker, CA, recruited a bunch of workers from LA's skid row, and proceeded to build a hotel, a church, a man-made lake, and a cross-shaped health spa with mineral baths drawn from the nearby Soda Springs. He also later constructed a radio broadcast studio, a private airstrip called "Zyport" and several other buildings, including a castle. Springer named his spa "Zzyzx", which he claimed was the last word in the English language, thus meriting his resort's slogan of "the last word in health". About this, Springer was correct: Zzyzx did indeed already exist as a word, a genus of sand-wasp named in 1937 by V.S.L. Pate, named for the sound the insect makes when flying. Springer did, however, make up the pronunciation, which he decided should sound like the phrase "Size Six" only with a Z, as opposed to the commonly believed rhyme with "physics". Over the following years, Curtis used Soda Springs to bottle water for drinks he sold to travelers through the desert, and ran a successful Christian resort espousing the curative powers of mineral waters, the evils of drink, and the destructive nature of arguing. Unfortunately, Springer did not have a legal claim to the land, and he was arrested in 1974 by United States Marshals for squatting and falsely advertising products like Mo-Hair, which he claimed was a cure for baldness, and "magic health potions", which were mostly just celery and carrot juice. The land was reclaimed by the government and Springer spent a couple months in jail, despite being defended by colorful criminal attorney Gladys Towles Root, who wooed juries with wild costumes and Cruella Deville-style hats. Springer moved to Las Vegas and died in 1985, but will forever be remembered for bringing fame to a ridiculous word gracing a highway on the way to Vegas, several rock songs, and a really terrible movie with Tom Sizemore, which reportedly only grossed $30 total at the box office. As for Zzyzx being the last "place" word in all of American geography booksЕ unfortunately, there's allegedly a street named "Zzz" in Bangs, Texas, and a street named "Zzzz" in Kearney, Nebraska. Sorry, Doctor.